Cadillac's newest SUV gets a 2.0-liter turbo engine, nine-speed automatic, and all-wheel drive. On the eve of the 2018 New York Auto Show, Cadillac added another SUV to its car-heavy range of luxury vehicles during a reveal at Cadillac House in Manhattan. The 2019 XT4 is the brand's first-ever compact SUV, which Cadillac claims is "tailored for the next generation of luxury customers." It may end up being a hoot to drive, too, as Cadillac has fitted it with Active Sport Suspension and a potent 2.0-liter turbocharged four-cylinder engine, good for 237 hp and 258 lb-ft of torque, mated to a nine-speed automatic transmission. The all-new XT4 rides on what Cadillac calls "an all-new compact SUV architecture," though that's likely a lengthened version of the D2XX platform used by the and GMC Terrain. The additional wheelbase length will give the XT4 "segment-leading rear-seat spaciousness," Cadillac claims. The new model is just the beginning of an onslaught of new vehicles to come from Cadillac. “The first-ever 2019 Cadillac XT4 expands our successful SUV lineup to a segment where Cadillac has never been before,” said Cadillac President Johan de Nysschen. 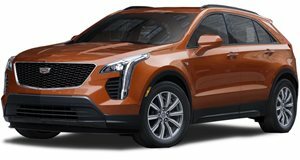 “And it sets off a dramatic expansion and elevation of the product range, that will see a new Cadillac virtually once every six months through 2021.” The launch of the XT4 also marks the debut of Cadillac's new "Y" trim strategy, which has been used automakers like Volvo and Hyundai as of late. Instead of offering a linear trimline, the paths diverge into luxury- and sport-oriented models that can sometimes be priced quite similarly with differing content. For XT4, the Luxury trim will be the base model, then Premium Luxury and Sport trims will sprout in a Y from there. Their main visual differentiators will be black trim pieces on Sport models while Premium Luxury models will wear bright trim work. Inside, all models will feature an all-new rotary controller to better command the Cadillac User Experience infotainment system and a wireless charging pad for your mobile device. The 2019 Cadillac XT4 will go on sale this fall with a base price of $35,790 including destination charge. Eight colors will be available at launch: Atlantic Metallic, Autumn Metallic, Crystal White Tricoat, Twilight Blue Metallic, Shadow Metallic, Red Horizon Tintcoat, Stellar Black Metallic and Radiant Silver Metallic. Order books open at the end of this month. Can the smallest sized Cadillac take a big bite out of the competition?